Russia's Hmeimim airbase in Syria. Two Ilyushin Il-76 military-transport airplanes from the Russian Aerospace Forces landed at Russia's Hmeimim airbase on Feb. 11 morning, delivering some 50 tonnes of humanitarian air for the Syrian population. 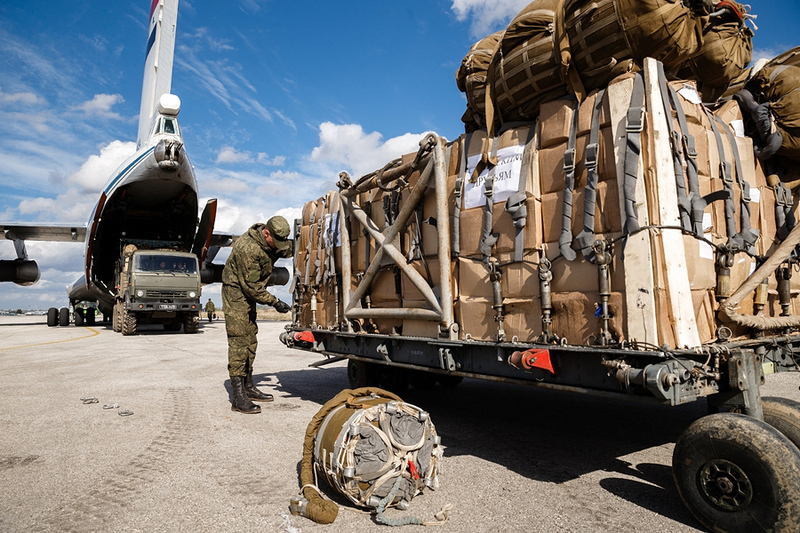 Representatives from the Russian Aerospace Forces group in Syria have said that these relief supplies are intended for the residents of the country's cities and districts besieged by activists of terrorist organizations. Apart from food and medicines, the cargo also includes clothes, school supplies and gifts for children - sweets and toys. Earlier, Syria's military-transport airplanes delivered the latest consignment of over 50 tonnes of joint Russian-Syrian humanitarian aid to the city of Deir ez-Zor, in north-eastern Syria.